Site work has started at Assembly Row Block 8 for the upcoming mixed-use building that will bring another 500 residential units to the Somerville neighborhood. Block 8 will also include over 26,000 square feet of restaurant and retail space. Residential amenities are set to include a 4th-floor courtyard with a pool & private patios and a rooftop outdoor terrace. The project sits next to the Orange Line MBTA station and Montaje, completed in 2017, with rents ranging from around $2200 per month for studios up to $5000 for three bedroom units. Federal Realty Investment Trust announced a slate of key promotions for its Northeast team today to support the company’s continued growth in 2019 and beyond. In addition to its flagship, mixed-use neighborhood, Assembly Row, the Northeast team oversees nearly 3.7 million square feet of commercial real estate in this region, including neighborhood and regional shopping centers, and residential, office and retail mixed-use projects in Connecticut, New York, and Massachusetts. Patrick McMahon has been appointed senior vice president, regional development. Mr. McMahon joined Federal Realty in 2013. With nearly 20 years of real estate development experience, he is responsible for the management of the Trust’s development pipeline in the Northeast. Liz Ryan is now vice president, regional leasing. Ms. Ryan joined Federal Realty in 2015 and has over 15 years of retail leasing experience. In this role, she leads the leasing and merchandising activities for the Trust’s Northeast and Chicago assets. Mark Brennan is now vice president, regional development. Mr. Brennan, who joined the Trust in 2017, has been active in real estate development for over 15 years. In this role, he is responsible for all phases of development for the Trust’s New York assets. Brad Dutton is now vice president, regional construction. Mr. Dutton joined Federal Realty in 2015 and has over 20 years of construction experience. In this capacity, he manages all phases of construction for the Trust’s Northeast portfolio. Matt Ehrie has been promoted to vice president, regional portfolio manager. Mr. Ehrie joined Federal Realty in 2015 and has over 30 years of asset management experience. In this capacity, he oversees the strategy and performance of the Trust’s Northeast portfolio. Corcoran Management Company has acquired a parcel located at 1100 Revere Beach Parkway for $14.76 million. The property is ln the dense urban community of Chelsea and features 222,000 square-feet of built property on a 36.5-acre parcel including 768 parking spaces. It is anchored by Home Depot and CVS, this property offers services including fast casual dining, health and beauty, fitness, and apparel. The property has a daily traffic of 39,600 vehicles. New Hampshire-based, XSS Hotels has acquired the hotel portion of Alloy at Assembly Row for $37.29 million. The hotel is a 159-key Marriott Autograph Collection boutique hotel on levels two through five. The property features a 13-story mixed-use building featuring 122 condominium residences on levels six through 13, the hotel on levels two through five and approximately 21,000 square feet of first-floor restaurant and retail space. Residences at Alloy range from studios to three-bedrooms; the building's 107 luxury residences are sold out. 15 residences at Alloy are designated affordable and will be offered through a lottery. The 107 luxury condominium residences at Alloy at Assembly Row, a new-construction building opening early 2018 that is the first homeownership option at Somerville’s booming Assembly Row mixed-use transit-oriented development, have sold out 100% prior to construction completion. 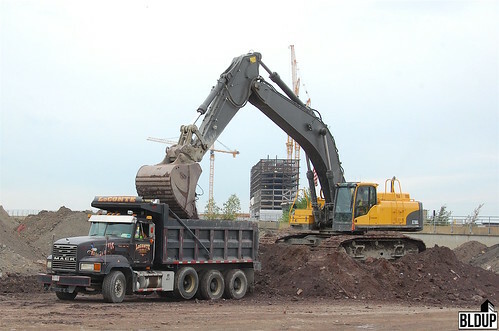 Construction of Alloy began Winter 2016, and condominium sales began about 16 months ago. Condominiums reportedly sold at an average of $800,000 each, with select penthouses topping $1 million; sales of Alloy condominiums have not yet closed. Alloy will feature amenities for condominium owners including an exclusive rooftop deck and club room, a swimming pool, a fitness center and concierge service. An additional 15 condominiums at Alloy are designated affordable; a lottery for these residences will be held in the coming months. On the 13-story Alloy’s lower floors will be a 159-key Marriott Autograph Collection boutique hotel and approximately 21,000 square feet of first-floor restaurant and retail space. 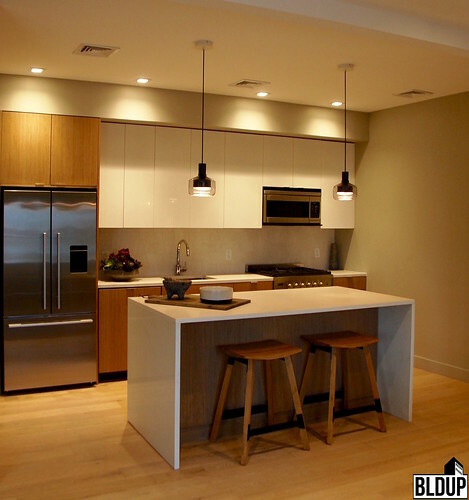 Alloy is located steps from the new Assembly MBTA Orange Line station, minutes from Downtown Boston by transit or car. Alloy only has 10 condos left! Will you be next? Federal Realty proposes to construct a new 525,300 square foot building at Assembly Row featuring 500 residences and approximately 26,500 square feet of restaurant and retail space. The building would be located on Assembly Row’s Block 8, next to the Assembly Square MBTA Orange Line station. Federal will open Montaje, another luxury residential and retail tower at Assembly Row located next to the proposed building, this Spring. The proposed building would be located between Montaje and a recently completed 825,000 square foot office and retail development home to the headquarters of Partners Healthcare. Plans for the proposed building have been filed with the City of Somerville, who is now reviewing the project. 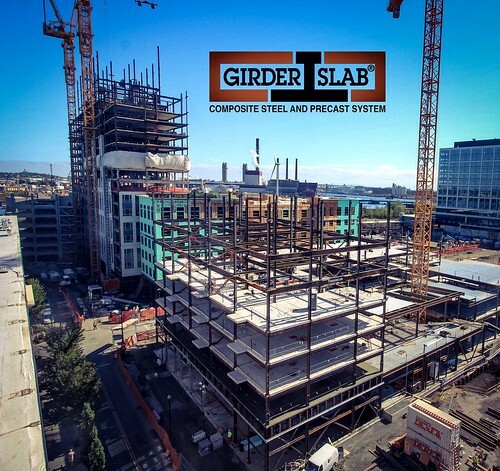 Installation of Alloy at Assembly Row’s facade along the building’s topped-off 13-story steel frame is underway, with moisture-resistant cladding nearly fully installed and brick finishes installed along a large section of the building’s base. Windows will soon be installed along the facade to fully weatherproof the frame. Private balconies, which will be features of a number of residences, are also being installed along the facade. Residences at Alloy at Assembly Row, located minutes from Downtown Boston, will be graced with sweeping, tranquil views of the Mystic River and its’ surroundings. A total of 122 luxurious residences including studios, one-bedrooms, two-bedrooms and three-bedrooms are now on sale at Alloy at Assembly Row. Residences will be located on the building’s upper levels and will be graced with top-quality finishes and distinguished amenities including a resident clubroom, roof deck, and a swimming pool and a fitness center (which are located in the hotel downstairs). Alloy at Assembly Row is located steps to the Assembly Row MBTA Orange Line station and right on Interstate 93N/S, allowing for an easy commute to Downtown Boston, Cambridge and Route 128. Both a Marriott Autograph Collection boutique hotel and approximately 21,000 square feet of ground-floor retail will be located on Alloy at Assembly Row’s lower floors, conveniently allowing residents to enjoy a live, work and play lifestyle. Assembly Row’s multiple exquisite shops and restaurants are also located just an elevator ride away. 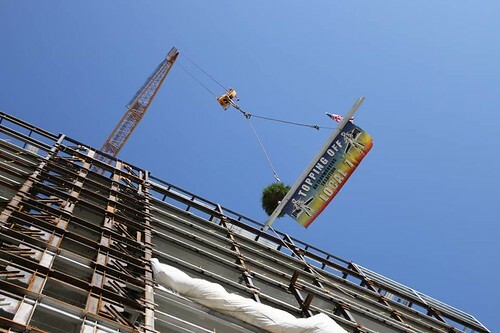 Alloy at Assembly Row’s 13-story steel superstructure, which will feature distinctive new luxury residences with sweeping views of the Mystic River, has topped off. With steel framing complete, weatherproofing of the superstructure has begun. Moisture-resistant cladding has been installed along a large section of Alloy at Assembly Row, and brick finishes are beginning to be installed. Alloy at Assembly Row is now a prominent feature of Assembly Row’s growing skyline and will further activate the bustling shopping and entertainment district with new housing, a Marriott Autograph Collection boutique hotel and approximately 21,000 square feet of ground-floor retail. A total of 122 residences including studios, one-bedrooms, two-bedrooms and three-bedrooms are now on sale at Alloy at Assembly Row. Condominiums will be located on the building’s upper levels and will be graced with top-quality finishes and distinguished amenities including a clubroom and roof deck. Alloy at Assembly Row is located steps to the Assembly Row MBTA Orange Line station and right on Interstate 93N/S, allowing for an easy commute to Downtown Boston. 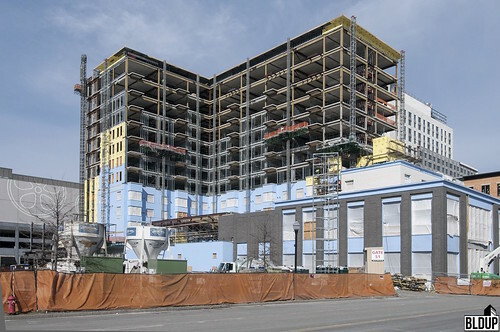 Curbed Boston reports that 45% of the 122 residential condominiums at the under-construction Alloy at Assembly Row mixed-use building located in Somerville's Assembly Row neighborhood are under agreement after under eight weeks of pre-sales, a figure confirmed by Alloy at Assembly Row marketing firm The Collaborative Companies. Some condominiums have traded for over $1,000 per square foot; units at Alloy at Assembly Row will range from studios to three-bedrooms with prices ranging from $500,000 to $1.5 million. 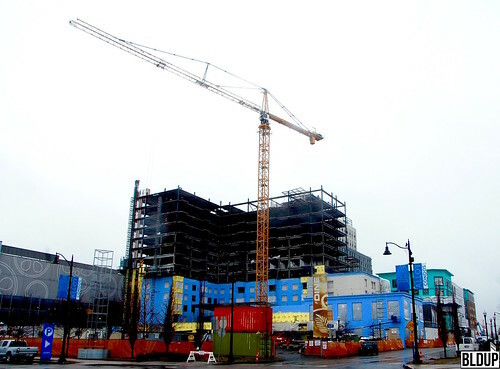 Construction of Alloy at Assembly Row commenced in February 2016; completion is anticipated by early 2018. Alloy at Assembly Row will feature 122 residential condominiums on levels six through 13, a 159-key Marriott Autograph Collection boutique hotel on levels two through five and approximately 21,000 square feet of ground-floor retail. Visit AlloyAtAssembly.com for condominium sales information.